Today, we take our drinking water for granted and expect the water from our taps to be clean and safe. Located in the oldest part of Hereford’s Victorian water pumping station, which first pumped in 1856, is our exhibit that tells the story of how drinking water is brought to a tap today. Herefordshire is a sparsely populated rural county with wide river valleys and rolling hills, but no natural lakes or large underground water sources. Through its heart flows the River Wye and its tributaries, which supply the drinking water for three quarters of the county. For the remainder, mainly those living north of Leominster and in parts of the Golden Valley, water is taken from boreholes. 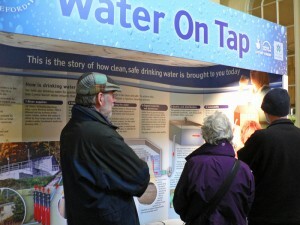 The Water on Tap exhibit explains how floating debris is filtered by screens at the water intake on the riverbank before being lifted by large pumps to the modern water treatment works on Broomy Hill. Here, it is treated to remove the small particles (most of which are invisible to the eye) so that the water is safe to drink and has no unwanted taste or odour. It also explains how Dŵr Cymru Welsh Water constantly monitors the quality of the treated drinking water by taking thousands of samples each year. Hereford’s modern treatment works on Broomy Hill is computer controlled and can supply 57 million litres of safe drinking water every day - enough to fill 18 Olympic-sized swimming pools.